The new ST-8300M (monochrome) and ST-8300C (color) cameras are based on Kodak's KAF-8300, 8.3 megapixel, full frame CCD. This CCD array has 3326 x 2504 pixels at 5.4 microns making it ideal for both short fast optics in high resolution (unbinned) mode, and for longer focal lengths it can be binned binned 2x2 or 3x3. The CCD has both antiblooming and microlens technology to improve the effective Quantum Efficiency of the sensor. As a result it can be used in a wide variety of optical configurations. 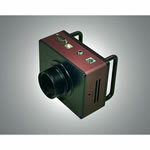 The camera electronics are USB 2.0 for fast download rates and rapid focus mode. The small light body accepts both c-mount and standard 35mm Nikon camera lenses. A built-in mechanical shutter is included for automatic dark frames. In addition to its imaging capabilities, it can also be used as a guider. Dark Current ~0.02e-/pixel/sec at -10C. 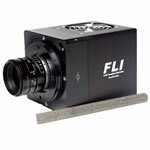 Large High Resolution Imaging CCD. The KAF-8300 CCD is approximately 18 x 14mm and has a diagonal measurement of about 22 millimeters. This is about 1.6X the image area of an ST-10 and nearly the same area as the STL-4020M. 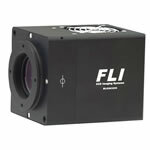 With its relatively small pixels and large image area it is ideal for wide field imaging with short fast telescopes and camera lenses and at the same time is flexible enough to be used on long focal length Schmidt-Cassegrains. The ST-8300C single-shot-color version of this camera can be used in high resolution mode (only) for color images, or binned 2x2 or 3x3 for monochrome imaging. The ST-8300M monochrome camera can be used with a filter wheel in any of several binning and partial frame modes for monochrome, color or narrowband imaging. Binned 2x2 the pixels are 10.8 microns square and binned 3x3 they are 16.2 microns square. At 2x2 the array is still 2 megapixels and at 3x3 just under one megapixel. 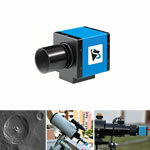 This feature makes it possible to match the pixel size to your seeing and scope, from a small refractor to a large SCT. With the ST-8300M monochrome camera binning will not only help optimize the sensitivity of the CCD with the user's optics and seeing conditions, but also speeds up the download rate. SBIG software drivers allow the user to combine any of several binning modes and partial frame in various ways to suit the user's optics, seeing conditions and objects of interest. For example, when imaging planets the sensor can be used in high resolution (5.4 micron pixels) mode while downloading only a quarter frame to speed up the data collection process. 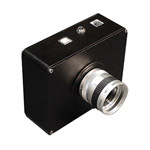 On nights of less than good seeing, or when used at longer focal length scopes such as Schmidt-Cassegrains, the sensor can be binned 2x2 or 3x3 in full frame mode to match the conditions while maintaining the full field of view of the CCD. The various frame and binning modes are shown in the table at right. These frame and binning modes, coupled with the large sensor area and 8.3 megapixel array make the ST-8300 cameras extremely versatile and adaptable to a very wide variety of telescopes and conditions. For this reason, plus the camera's small size and breakthrough price point, we feel the ST-8300 is an ideal entry level camera and a superb backup camera for anyone, even advanced users. The ST-8300 will download a high resolution, full frame image in approximately 7.5 seconds, and focus with approximately 1 second update rates in planet mode (a high resolution 20 x 20 pixel box located anywhere on the CCD by the user) when connected to a high speed USB 2.0 port. Full frame low resolution, high sensitivity finding and focusing may be done with ~ 2 second frame updates. The camera is also compatible with USB 1.1 ports albeit at a slower download rates. The 9-pin I2C port allows the use of our filter wheels with the same interface. The power and commands for the filter wheel all come from the camera through this port, so there are no other cables or power supplies needed to operate the filter wheel. Also, the same software that controls the camera also controls the filter wheel. SBIG plans to offer two custom filter wheels for the ST-8300M camera. The first will be a 5-position filter wheel that will be thin enough to accept a Nikon lens adapter for shooting filtered images through any Nikon 35mm lens. The second filter wheel will hold more than 5 filters and is intended for those wishing to do both LRGB and tri-color narrowband imaging without having to change filter wheels. In both cases, automatic exposure sequences may be set in advance for hands off acquisition, or the user may control the filter wheel for each exposure if desired. The guider port on the ST-8300 is the same as on the other ST cameras, using a modular telephone type 6-pin jack to connect the ST-8300 to the user's mount when using the camera as an autoguider. The internal relays used in the ST-8300 design are opto-isolated, so that no external relay box is required with any mount if the camera is being used as an autoguider or if it is being used to control the telescope in Track & Accumulate mode. Of course, a relay box can still be used, although not required, for convenience if the user already has one wired to a mount for another camera. Although small and light, the camera is built to last. The front plate, main body and rear plate are each machined from solid aluminum block for maximum strength and then hard anodized over a special bead blasted finished for durability. Connector labels are laser etched and will never wear off. The ST-8300 comes with its own universal AC power supply. 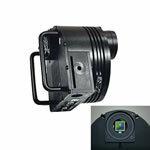 This supply will operate from 100-240VAC and provides 12VDC at 3.75A to the camera. The ST-8300 also has a built-in voltage regulator and can therefor be powered directly from any unregulated 12V (10 - 14 volts) source such as a batter for operation in the field. The universal AC power supply is relatively small (1.2x2.3x5.2 inches, 30 x 58 x 132mm) and light weight (9 ounces, 254 grams). However in the event that the user needs to locate this supply more than 6 feet (~2m) from the camera, an 8 foot (~2.4 m) low loss extension cable with matching locking connectors is available as an option. SBIG also sells a 12VDC battery cable with alligator clips and a cigarette lighter adapter plug. A mechanical shutter is included to facilitate dark frames. This is a necessity for anyone operating remotely, even if remotely means a few feet away from the telescope. Adding a shutter to a camera design increases the cost and size of the camera body but we feel these trade-offs are worth the added convenience and functionality. Since the early days of the original ST-7 camera, SBIG has been providing even-illumination shutters in our cameras, something not found in the majority of other cameras made for astrophotography. "Even-illumination" means that the shutter mechanism is designed to open and close in such a manner that it does not change the proportion of light falling on the sensor due to the shape or motion of the shutter itself. This is what one finds for instance with an iris type of shutter that opens-up starting at the center and closes over the center last. In the ST-8300 we use a simple and very robust shutter wheel with a fan-shaped aperture of the same design that we have employed in the ST series cameras for the past 15 years. The ST-8300 shutter sweeps over the CCD without leaving any area of the sensor exposed for a different period of time than any other area. Another benefit of the rotating disk type of shutter is that it has only one moving part - the motor. 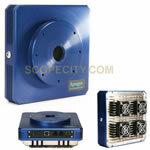 These motors are extremely reliable and can operate for millions of exposures without failure. In 15 years with thousands of cameras in the field taking millions of exposures, this shutter design has proven itself better than we can describe. Since the ST-8300 can also be used as a guider, a myth that needs to be addressed here concerns the use of a shutter in any camera or autoguider design. Interline CCDs such as the ones used in the ST-2000 and STL-11000 do not require a mechanical shutter to time exposures or to read out the sensor without smearing. Full frame CCDs such as the ones used in the ST-8, ST-10 and this ST-8300 cameras do require a mechanical shutter to cover the CCD to prevent smear during the read out process. But there is another important reason why we have put shutters in all of our cameras after the original ST-4, and that is the ability to automatically take a dark frame. We recently read comments that having a shutter in an autoguider might be undesirable due to the reliability factor and the number of exposures it had to take. We completely disagree, provided of course that the shutter design is as reliable as the use to which it is intended. In fact having a shutter for taking darks was one of the "must have" requirements for any autoguider we made, and is the reason we built one into the new SG-4 autoguider. Having a shutter enables the autoguider to take a dark frame periodically to improve the guider's sensitivity to faint stars by reducing noise in the image and by reducing the bright pixels that can confuse the autoguider. Guiding on bright pixels appears to be quite accurate, until one sees the resulting image! Just remember that not all shutters are of the same design and not all shutters suffer from the same problems. Our design is proven and reliable. In our initial tests the camera reached a maximum of -40 degrees C below ambient in a warm room approximately 2 1/2 minutes after the cooling was turned on. It was allowed to stabilize and after a few more minutes the regulation was enabled A few degrees were then given up for regulation with the camera running at only 70% TE cooling power to maintain -36 degrees C below ambient, and 82% power to maintain -38 decrees C below ambient. Because of this CCDs extraordinarily low dark current, great temperature deltas are not required to achieve a dark current low enough that it becomes relatively insignificant compared to the read noise and sky background (See dark current data below). For example, in a test, one 15 minute dark frame taken at -10C was subtracted from another 15 minute dark frame taken at the same temperature. The total noise in the remaining image was ~15 electrons which included both dark current noise and read noise. This is exceptionally low. According to Kodak, the dark current of the KAF-8300 is less than 200e- at 60 degrees C with a dark current doubling temperature of 5.8 degrees. This means that for approximately each 5.8 degrees C that one warms the CCD, the dark current is doubled, and for each 5.8 degrees C one cools the CCD the dark current is halved. Extrapolating this to -10C we can calculate the maximum dark current we can expect to find at that temperature. In fact, Kodak's specifications are usually very conservative when it comes to dark current, and this value can vary from chip to chip by 50% or more and still remain within the allowed specification. When we measured the 8300 we found it to be less than half of Kodak's allowed specification. This is also typical of what we have seen in other Kodak CCDs. In our tests we measured the dark current in our sample to be about 0.01 electrons at -10C. Again, these are extremely low dark current values for a full frame CCD. The Dark Current chart on this page was made using the prototype camera's dark current measurements. Even at zero degrees C the dark current was well below 0.05 electrons! At -10C we measured about 0.01 electrons making it the lowest dark current of any camera currently made by SBIG.